The Millet Veteran Fire Fighters Association, formed in 1998 to help provide necessary equipment, training and resources to The Millet Volunteer Fire and Rescue Department, was able to reach its latest goal of purchasing a MSA Evolution 5800 Thermal Imaging Camera for the department. This goal would not have been reached without the generosity of The Royal Canadian Legion Millet Branch 229 and The Millet Fish and Game Association. The support of other like-minded organizations is absolutely vital to The Millet Veteran Fire Fighters Association to fulfill its mission of helping to better our fire department. “We started this project two years ago and we’ve just now completed it thanks to the overwhelming support from The Royal Canadian Legion Millet Branch 229 and The Millet Fish and Game Association. 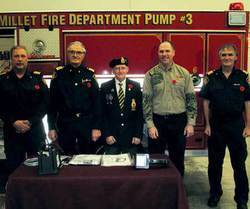 We respectfully appreciate their assistance on this project,” says Al Kilborn, President of The Millet Veteran Fire Fighters Association. The cost of this project was $9,419.74. The new user friendly equipment is an invaluable tool for our fire fighters enabling them to locate hidden heat sources, fires in walls, ceilings and attic spaces, as well as lost or hiding victims or downed fire fighters in burning structures. It can also be used to find individuals that may have wandered away from the scene of an accident, to locate someone lost in the woods or to be able to see down a deep hole or well. Its uses are many and help our fire fighters do their jobs more effectively and safely. Guy Jones of The Royal Canadian Legion Millet Branch 229 and Jeff Gibbons President of The Millet Fish and Game Association, were present at The Millet Fire Hall November 6 to present the camera, along with Al Kilborn. This is the second thermal imaging camera for The Millet Volunteer Fire and Rescue Department and will be carried in the department’s first response rescue vehicle.